Requires a 5" Backing Plate. Buff & Shine 6" Uro-Cell 3-Pack Mix & Match Bulk Special. Select from the drop down menus to mix and match any pad combination. The Buff and Shine Uro-Cell Pads are designed to quickly produce the results desired by professionals with forced drive DA Polishers and rotary buffers. Professional Auto Detailing Technicians are reporting impressive results with less time by using the Buff and Shine Uro-Cell Foam Pads with their favorite compounds, polishes and finishing products. Mix & Match - You Pick. The Buff and Shine Uro-Cell Foam is imported from Europe and was specifically designed for use on automotive surfaces. Its design was driven by the OEM auto manufacturers who demanded highly durable foam pads that can quickly produce great results in the factory's intensive buffing environment where it is common to find dozens of buffing technicians working non-stop every day, all day long to perfect the fresh paint of hundreds of newly manufactured vehicles coming off the assembly line. Buff and Shine has positioned itself to be at the forefront of euro foam technology with the introduction of two categories of foam pads constructed with the finest available imported European foam. Buff and Shine's Uro-Cell Foam Pads, are designed for a wide variety of polishers and buffers, including standard dual action and random orbital machines, gear-driven DAs, and rotary (high-speed) polishers. 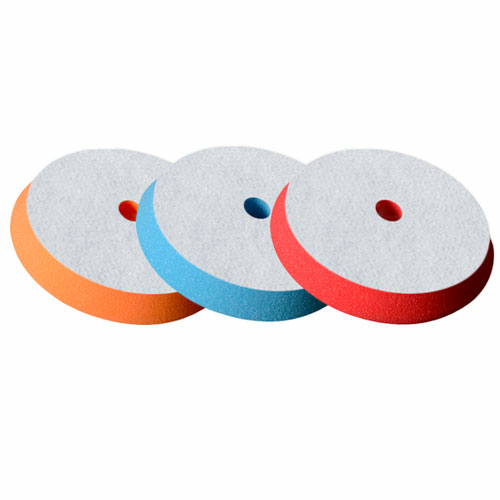 If you use a long-throw or long-stroke dual action polisher, we suggest you use Buff and Shine's Uro-Tec or Low-Pro Foam Pads, which are specifically designed for these machines. Technicians are reporting amazing results with less time using the Uro-Cell Foam Pads with their favorite polishes and compounds. There is a reason for this. The Uro-Cell pads use closed-cell foams, which has several benefits. first, closed-cell foam greatly reduces absorption of chemical, so that the chemical remains in contact with the paint surface much longer. This yields more efficient buffing and quicker paint correction times. Another benefit of closed-cell foam is chemical savings. Because the polishing or compounding chemical does not readily soak up into the foam, less product is required to do the same amount of work. Less saturation of chemical into the foam pad results in less wasted product! And buffing technicians find that because the product is not soaking into the pad, the performance of the pad and chemical is consistent for a longer period of time between re-applications of product--that is, it takes longer for the dollop of product to "wear out". Yet another benefit is that these pads work fantastic with newer water-borne, VOC compliant, or "high water content" detailing chemicals. The pads bring out the best performance from these products, providing even dispersion across the pad and the vehicle surface. Since the chemical is not soaked into the pad, the pads are very easy to clean. Cleaning is as simple as washing with water or you can use your favorite pad-washer, or throw several used pads in a washing machine for safe cleaning.